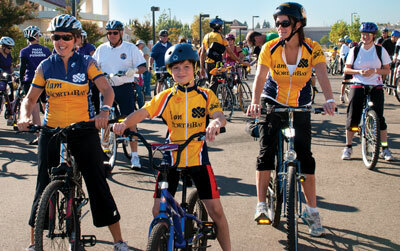 Dr. Deborah Murray, left, leads a 10-mile ride with young diabetic Colin Kent, center, and Colin’s mom, Michelle, at NorthBay’s inaugural Ride to Defeat Diabetes in 2012. This year’s event—which will feature a 10-, 25- and 60-mile rides—is planned for Sunday, Oct. 6 and will begin at the NorthBay VacaValley Hospital parking lot. Money raised will benefit the NorthBay Center for Diabetes & Endocrinology and its mission to raise awareness of the diabetes crisis in Solano County.